This year’s IEEE Day theme, “Leveraging Technology for a Better Tomorrow”, is something you will find today’s global IEEE community engaged in each and every day. 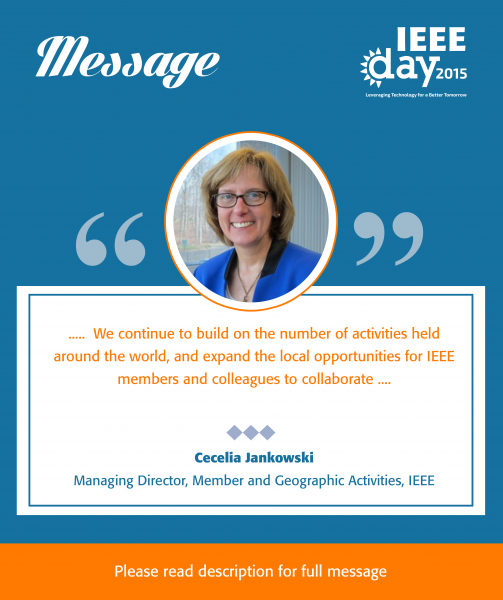 It is an activity that successive generations of IEEE members and volunteers have been doing for more than a century. In the twentieth century, IEEE members brought the world advances in telecommunications, computing, aerospace, and a diverse array of fields. And, in these opening decades of the twenty-first century, we find IEEE members at the forefront of the convergence of the technological and the biological, quantum computing, and sustainable energy, to name just a few of the myriad fields IEEE members are exploring. Almost every day, I encounter new stories from our community about the inspiring ways IEEE members and volunteers are leveraging technology to improve the quality of life for those around them. These are the many men and women who are not waiting for a brighter tomorrow to arrive—they are building it themselves. 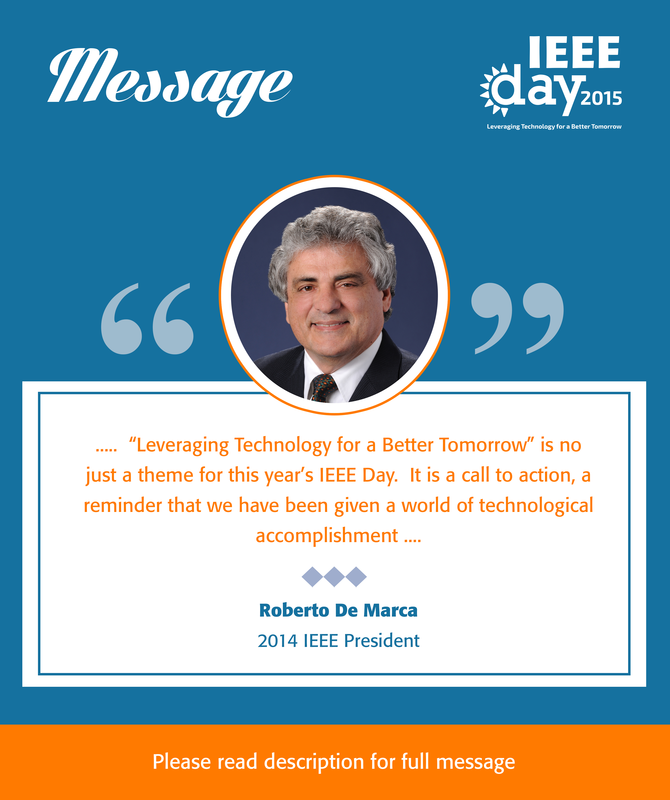 As we mark IEEE Day 2015, we should all take a moment to recognize those engineers and technologists making a difference in today’s world…and tomorrow’s. Happy IEEE Day 2015 to All! their technical home and IEEE Day provides them the perfect opportunity to share their knowledge, enthusiasm and make new friends. Best wishes to IEEE members worldwide in planning their events and a special thanks to the IEEE Day Team for their commitment and passion as we celebrate IEEE Day 2015! From aerospace engineers helping us understand the cosmos to those working on nanotechnologies on the smallest of scales, you will find IEEE’s students, Young Professionals, Fellows, members and volunteers making a difference in their communities and in our world. Their innovations, discoveries and insights have changed our world—and continue to change it—in countless ways both big and small. Today, those within the IEEE community can be found on every continent, building for a bright, promising future. Some are strengthening technology education from pre-university through continuing professional education. Many others are engaging in community-oriented humanitarian efforts, at levels greater than ever before. Still others are creating communities in emerging technologies that will play a key role in shaping the futures of those technologies. “Leveraging Technology for a Better Tomorrow” isn’t optional for those within the global IEEE community—it is an intrinsic part of our community’s past, present, and future. It is what drives those within our community to dare to strive towards greatness—and once greatness is achieved, to look to the next challenge in which they can help to build a better tomorrow. IEEE Day marks a very important event in the history of the world. It is the celebration of the first time in history when engineers worldwide and IEEE members gathered to share their technical ideas in the year 1884. As the IEEE Region 10 Director, I take immense pleasure in wishing all the members around the world a happy IEEE Day. As an IEEE member, make sure to pave your path in technology and create technological solutions, which touches the lives of people. IEEE being the world’s largest professional organization plays an important role of connecting all the like-minded members to make the world a better place. The coming year also marks high importance for IEEE Region 10 which enter into the commencement of Golden Jubilee Anniversary. We invite all the members across the globe to join us in celebrating the occasion to look back at the contributions and also look forward to our vision. It is time for all of us to leverage technology to create a better tomorrow. Happy IEEE Day once again. There are those who consider what the future holds for our world, and wonder what will come next. There are others who don’t bother to consider what the future might hold—they want to be a part of creating that future. IEEE’s students, Young Professionals, and all the members of our global IEEE community are very much in that second category. Every day, IEEE members and volunteers are actively engaged in leveraging the advances of our present-day into the promise of a brighter, better tomorrow. The men and women of IEEE—around the world—are making strides across the breadth of engineering disciplines, and leading initiatives that explore today’s emerging technologies. “Leveraging Technology for a Better Tomorrow” is not just a theme for this year’s IEEE Day. It is a call to action, a reminder that we have been given a world of technological accomplishment, and it is incumbent upon us, as professionals, to build upon those successes to make life on our planet better for all. Your passion, your commitment, your desire to envision, innovate, and create; these are the hallmarks that define your efforts, and inspire others to join in them—and our global IEEE community is the better for it. Women engineers can make a difference in technology by thinking, acting, or approaching problems differently. The perspectives of women engineers can provide benefits in technology. Now, many people are realizing the value of women engineers. Women should be brought into technology careers more. It embarks change in the business world through support from consumers and legislators. It makes an impact and innovation in technology. That’s why we Women in Engineering are extending our activities globally to spread our mission and vision to larger communities. I’m really proud to be part of IEEE – the world’s largest professional association for the advancement technology and the WIE – the extremely valuable STEM resource for women and girls. Our global network is the most important factor for changing the world. Let’s work together to realize our dream of building a zero gender gap society where men and women will enjoy their life hand in hand in every corner of life with equal responsibility! 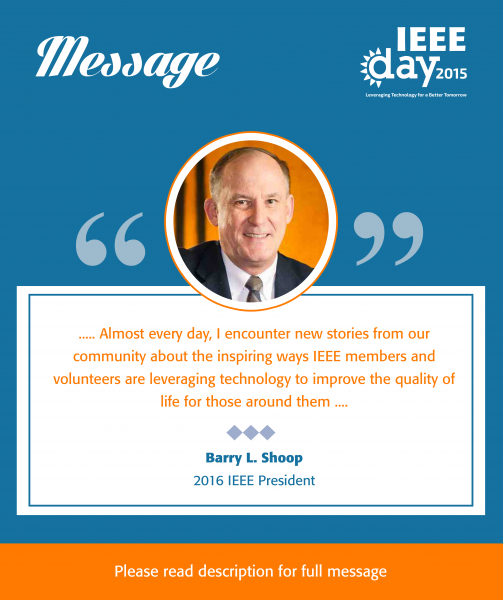 “The IEEE Day is a special day for all IEEE members, volunteers and staff as we celebrate the importance and value IEEE brings to each of us in our professional lives. As members, we have benefited from the various products, services and activities within IEEE thus enriching our careers and well-being. As volunteers, the IEEE has provided many opportunities for us to contribute back to our community and the profession. 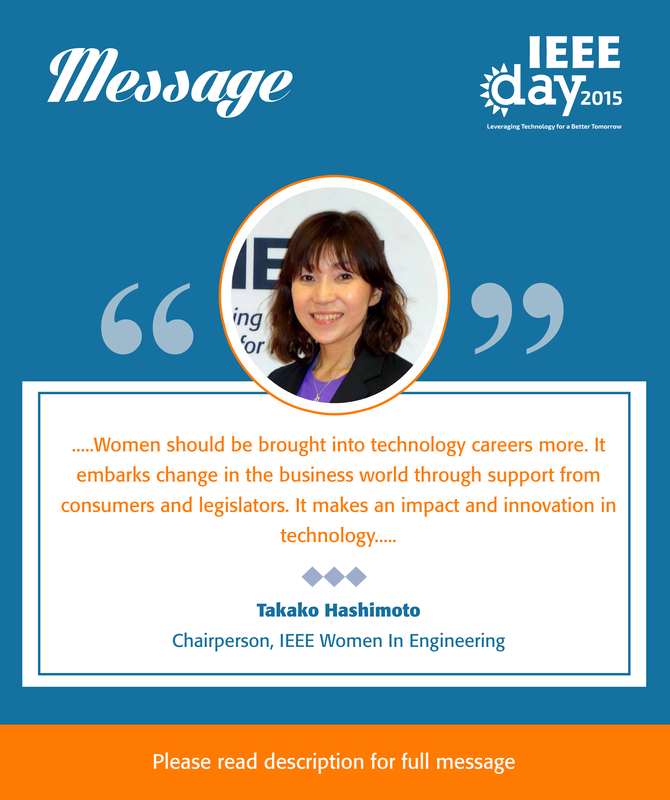 “Leveraging Technology for a Better Tomorrow” isn’t—and shouldn’t—be confined just to IEEE Day. 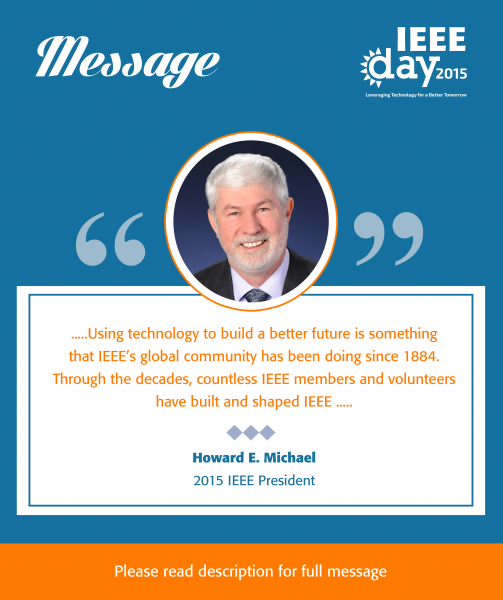 Using technology to build a better future is something that IEEE’s global community has been doing since 1884. Through the decades, countless IEEE members and volunteers have built and shaped IEEE into the world’s foremost organization for technical professionals. What we are today is the cumulative result of the work of generations of visionaries, innovators, and risk-takers. It’s a tradition that I’m proud to see continuing throughout IEEE. I’ve been to Sections and Chapters around the world these past few years, and with each new group I meet, I find yet another example of IEEE members and volunteers changing and improving our world in ways large and small. As we mark this year’s IEEE Day, I urge you—keep this proud tradition going. A century ago, the IEEE community was created and guided by legendary figures such as Edison, Bell and Marconi. Today, with innovation occurring at a breakneck pace, the IEEE ranks—particularly our students and Young Professionals—are filled with tomorrow’s Edisons, Bells, and Marconis. And I, for one, can’t wait to see the future they build.